We just completed our 7th year educating the public on the joys of Colored Boston Terriers at the America's Family Pet Expo! 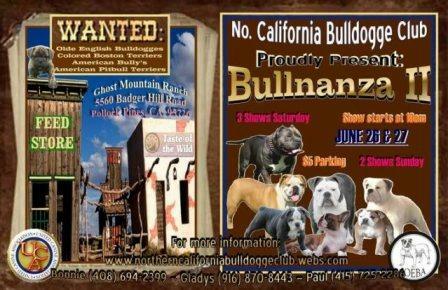 It was another great show, 30,000 people attended, and 600 rescues were adopted. We look forward to AFPE 2016 were we will enter the booth contest to raise money for Rescues. We are excited to announce that the ICKC has accepted colored boston terriers as a variety of boston terriers for conformation showing!!! You must be a member of the club to show your dogs but are not required to register each of you dogs with them. They use AKC/UKC judges to evaluate your dogs. Great News! Animal Health Genetics has graciously chosen to give Members of the All Color Boston Terrier Club a special price on their Juvenal Hereditary Cataract DNA Testing. It is now available to our Members for $40 per test!!! Anytime you would like a test please email our Member Gabby V at [email protected] and she can mail you the special ones with our Club Stamp on them for the discounted price. 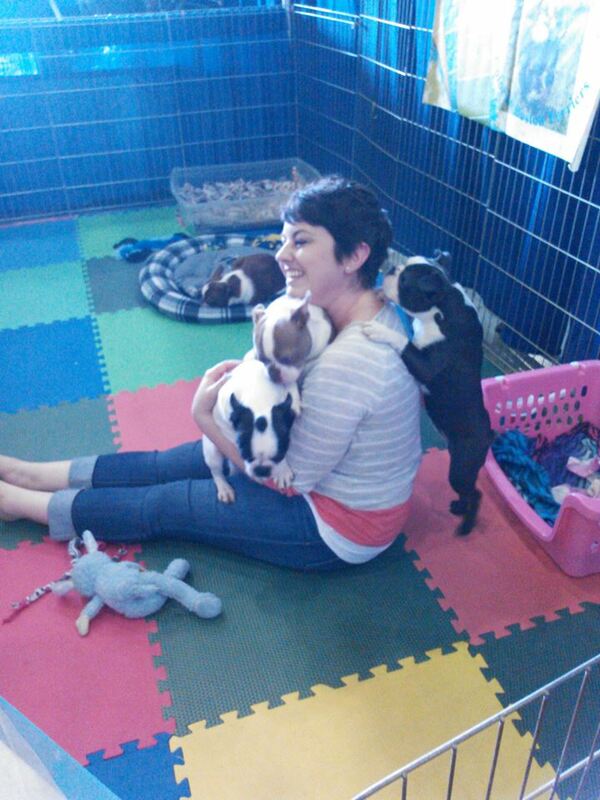 Come one Come All to Our Next Colored Boston Terrier Shows. Polluck Pines CA come out and have some fun!! Three UCA Shows...One Day...Hutto, TX. 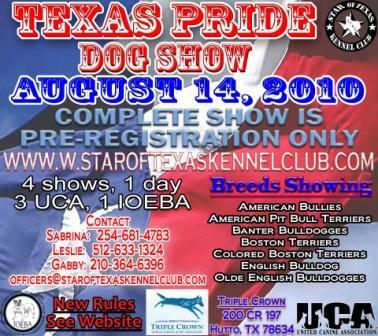 The Star of Texas Kennel Club is hosting a Conformation show for Colored and Traditional Boston Terriers on August 14th, 2010. 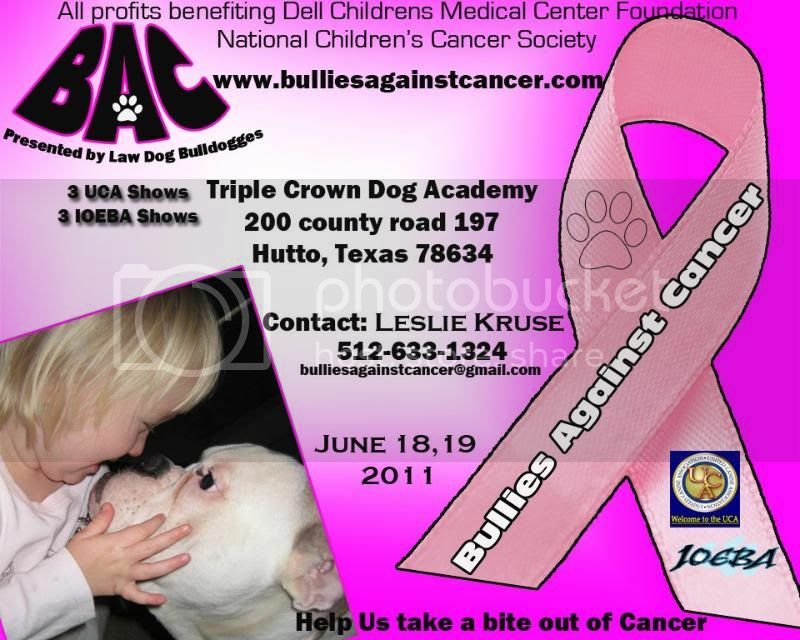 Please see the Star of Texas Kennel Club website for more information about showing and/or sponsoring an award. BAER/CERF Clinic Reno a success! The BAER/CERF Clinic in Reno May 24th was a great success. They BAER tested 23 dogs and Cerf'd 14!! Way to go breeders! Dr Collette came from UC Davis and Dr Lavash did the Cerfs. We thank him for once again letting us use his office! !